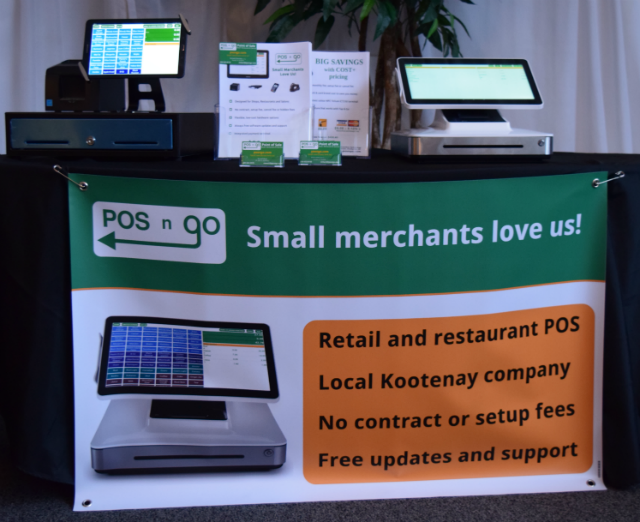 The POS-n-go team attended yesterday's Kimberley Chamber of Commerce Mind to Market Business Expo at the St. Eugene Resort. With over 30 exhibitor's, local business owners were able to meet a wide range of B2B product and service providers. Those people who made it out were able to access information on starting a business, planning for success, financing, tel-com infrastructure and a host of other services. Team POS-n-go showed off the latest PayPoint all-in-one POS machine that puts a dash of sleek modern style into the old fashion cash register. Plus, with POS-n-go tracking sales, managing inventory and customers, you have the knowledge of how your business is performing, at any given time, with almost 50 basic and in-depth reports. As well, attendees snacked on delicious appetizers, veggies, cheeses and cream puffs.